Acne is a disease of the sebaceous hair follicle on the face, chest & back. Acne can develop at any age. Mature acne is often due to hormonal imbalances. It is important to moisturize oily skin. There is a tendency to want to dry out oily skin, when this happens the sebaceous glands work even harder to produce more oil. 3. Occupations: In some jobs, exposure to industrial products like cutting oils may produce acne. How many treatments must I do to achieve clear skin? Treatments are performed every two weeks until your skin clears which takes anywhere from 6 to 12 weeks (about six treatments over a three-month period). This amount of time is crucial in order to get you mostly to completely clear and significant results will be seen at least within six weeks. 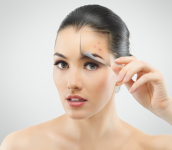 After your acne is under control, your home-care regimen is necessary to keep your acne managed. Office visits for acne treatments such as extractions and other professional treatments (high frequency, chem peel) every few months is recommended to keep your skin as healthy as possible.